HOME PRODUCTS &AMP; SERVICES DIRECTORY OF SUPPLIERS THERMAL FLUID SYSTEMS, INC. Since 1994 Thermal Fluid Systems has specialized in the sale and service of thermal fluid ("hot oil") heating systems for the process industries. Our scope of supply ranges from the heater alone through complete turnkey installations. 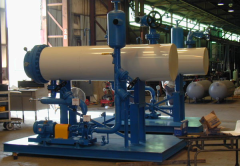 We also provide ancillary equipment including thermal fluid pumps, thermal fluid valves, tanks, filter systems, stacks, economizers and heat exchangers. The main advantage is that the systems run at a very low pressure, typically just the pressure required to pump the liquid around the system. When designed correctly they reliably and efficiently produce high temperature heat. They are simple to maintain with only the burner and pump needing regular maintenance. Our experience in system design and crucial component selection ensures low maintenance. We use high temperature air-cooled centrifugal pumps with a mechanical seal and bellows-sealed isolation and control valves to ensure this. Other benefits include no danger of damage due to freezing when the plant is shut down, no corrosion, accurate temperature control and high efficiency. Drawing on our own extensive experience and with the engineering backing of German technology companies who have been building and supplying thermal fluid systems for over 40 years, we can supply a system that exactly meets your process requirements for thermal fluid flow, temperature and capacity. We service what we sell and can provide on-site technical service and support, replacement parts from our extensive inventory and system and control upgrades. We have recently developed a thermal fluid sidestream filter system that uses special high temperature glass fiber wound depth cartridges, capable of removing particles down to 10 microns! 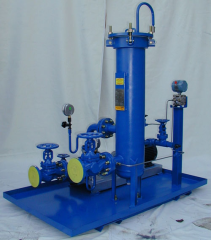 Units are available with and without pump and size matched to your system. View More Announcements from Thermal Fluid Systems, Inc.